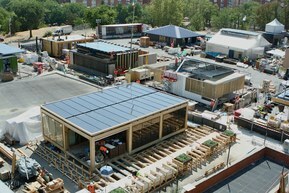 LAPP supported two different teams at the international student competition “Solar Decathlon Europe 2012”, which took place in Madrid in September 2012, and both teams performed exceedingly well. The team from the Hochschule Konstanz University of Applied Sciences (HTWG) made it to fourth place with their “Ecolar Home” submission and the Hungarian “Odooproject” was awarded sixth place in the overall ranking. At both universities, students from all faculties worked meticulously on their projects. The aim was to build a house of the future that is as sustainable and energy-efficient as possible. And both teams demonstrated this spectacularly. Team Ecolar from HTWG won first place in the individual discipline “Industrialization and Market Viability”. Taking first and second place, the two teams that used LAPP wiring celebrated a double victory in the “Engineering and Construction” category. The students had been building and working hard on their houses for two years. Thanks to the intelligent energy concepts used, the buildings that were finally produced met the standard required for a zero-energy building. LAPP worked very closely with HTWG on their house. From the living room right up to the roof, all cabling came from LAPP: ÖLFLEX® SOLAR cables for the photovoltaic system, ÖLFLEX® control cables for the electrics in the house, UNITRONIC® data network cables for the complex ventilation control system and other intelligent systems. "In times of dramatically rising energy costs, the call for sustainable systems is growing ever louder. The HTWG Ecolar Team has shown what form energy-efficient construction may take in the future with their many smart ideas. We are proud that we were able to support the young house builders with our products”, explains Reinhard Probst, Program Manager of Renewable Energy at U.I. Lapp GmbH. Halogen-free ÖLFLEX® CLASSIC 120 H cables were used for the wiring of all sockets and household appliances (oven, cooker, extraction hood, washing machine, dishwasher and tumble dryer). They are connected to a central control cabinet. These cables are flame-retardant and prevent any dangerous flame propagation on the cable. The shading, in the form of blinds, is also controlled by these cables. To connect all the KNX products (actuators and sensors) a UNITRONIC® BUS EIB H was used. These are special cables for the EIB (European Installation Bus) bus system to control lighting, underfloor heating, air conditioning, blinds, etc. EIB consists of sensors (control devices), e.g. for switches, thermostats and timer switches, and actuators for motors, heating, lamps and blinds. The sensor values are transmitted by well shielded, twisted-pair UNITRONIC® LiYCY (TP) data network cables. This means that commands can be given using a mobile phone or over the Internet without having to be at home. UNITRONIC® BUS EIB H cables were also installed for the connection between the temperature probes in the hydraulic system and the data connection. This is how the whole of the underfloor heating and cooling is controlled. The pumps in the hydraulic system are connected directly via halogen-free NHXMH cables that are installed in the wall. In the event of a fire, these cables would dramatically reduce the production of poisonous dioxins and furans. H07V-K single cores were used for the wiring inside the control cabinet, e.g. to connect the individual fuses with the relay. 24 photovoltaic modules on the roof and across the unused areas, as well as 6 modules on the sides, are connected using cross-linked ÖLFLEX® SOLAR XLR cables and guarantee the energy supply in the house. The solar unit is connected to the alternating current side (AC side) by ÖLFLEX® CLASSIC 130 H cables. 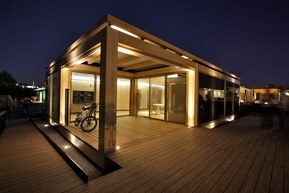 The ECOLAR house has since been dismantled in Madrid and reassembled on the campus at HTWG Konstanz. It will hopefully remain there for ten years and be used as a conceptual example for house builders of the future. 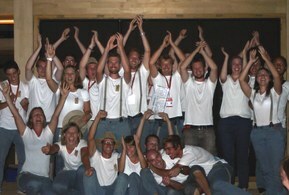 The Hungarian team from the Budapest University of Technology and Economics was also able to justifiably celebrate coming in sixth place. After all, a total of 20 teams took part in the European student competition. Their building was visually split into three parts comprising a southern summer wall with storage units and photovoltaic modules, a generous inner courtyard and a living area with a glass wall onto the courtyard and photovoltaic modules on the roof. For the wiring, LAPP Austria donated the cables needed for the building installation, such as ÖLFLEX® CLASSIC 130 H and H07Z-K single cores as well as ÖLFLEX® SOLAR cables for the photovoltaic system.